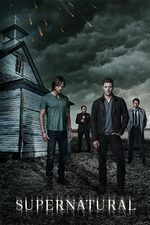 When multiple people are killed by dead loved ones, Dean, Sam and Jack investigate the mystery surrounding the murders and, each inadvertently, are forced to deal with unresolved grief of their own. Anyways. Interesting episode, even if a bit predictable. I'm sure there's a TVTrope page for "pretending to investigate therapist and end up getting therapy", and they walked right into it, but it made for some great scenes. I was surprised Jack went down so easily with a whack by a fireplace poker, and that he didn't defend himself with powers like he did the first time Dean shot at him. But I guess he's learning to be more human, although they need him to use his powers more. How creepy was Misha Collins' voice for Mister Inky? I loved Misha's duel roles here. A friend and I independently thought he sounded like he was channeling an evil Paul Lynde. Not that that's a bad thing. And then WHICH Cas crash-landed at the end there? I love being excited about this show again! Another vote for 'loved this one,' especially Misha Collins as the cosmic horror. I know why, when Castiel sees another person looking like Misha Collins, he registers it as someone who looks "like me." But that's not what Castiel looks like, it's what Castiel's human host looks like. And after however-many years as the sole occupant of The Human Body Formerly Known As Jimmy Novak, it maybe makes sense that Castiel does seem to consider it his body, or at least one of his bodies, not just as a matter of practicality or ownership but identity; and sure, the Doylist explanation for why he wore Jimmy Novak to the afterlife is a pretty boring one. But he wore Jimmy Novak to the afterlife. Can someone explain to me the cosmic evil clone thing? What was that? Anyway, I deeply enjoyed Dean in therapy, being obnoxious, Jack's seeing his "mom" and Dean's conceding that maybe Jack ain't all bad after all. Jameaterblues, do we know if the angels have bodies other than the humans they possess? I don't know if the show has ever dealt with that. Whenever we see them, on Earth or in heaven, it seems like they always have a human body they're possessing. They never shuck off the meat suit when they're in heaven, and reveal a "true" form. So, maybe Castiel looks like Jimmy because that's the only appearance he could have, unless he possessed another body. Can someone explain to me the cosmic evil clone thing? Well, we're gonna have to wait for the real explanation, if we ever get one. For now we just know that he(?) is some spooky entity/force that predates God, and he lives in the void and is very particular about not being disturbed out there. He may be some embodiment of nothingness itself. Maybe he's the brother of the nasty tar monster that killed Tasha Yar. My running theory is that he's of the same 'species' as God and Amara. Ursula: So we've definitely never seen angels in any other bodies, and like you say, we see them wearing human bodies even in Heaven. My memory of this part of canon is getting pretty shaky, but at least Zachariah and I think Castiel have talked about having other bodies too dangerous, not to mention huge and impractical, to wear around squishy mortals ("In Heaven I have six wings and four faces, one of which is a lion. You see this because you're limited.") Zachariah could, of course, be lying to the squishy humans, or maybe only certain angels get Lion Face status, but the way angels are about their wings, I did get the impression they're something they have, in some sense, all the time, whereas possessing humans on a large scale seems new. Though Castiel also talked one time about spending some time chilling out as a wave of celestial intent too, whatever that means, so who knows. Anyway...as far as I recall, it's not a super-settled point of canon, mostly because it's not of much consequence. But as I read it, the implication is that at least some angels have bodies independent of the humans they possess that they either can't or won't manifest on earth, at least not in a way humans can see. oh yeah, is that void the same void that Janet goes back to when she's not being summoned? When Jack is looking out the car window outside of Wes's house, he looked so much like Misha Collins that the Kid and I actually did a double take. The facial expression was so spot on. I love it when Misha Collins does voices. I still get confused when I hear his real voice. The scene with Jack and Mia as Kelly may have made me teary eyed.